Q. How do I bring references from databases into EndNote with Internet Explorer, Firefox or Chrome? In the database of your choice, select the references by clicking in the checkbox next to each record. Click on the Export/Save/Output to EndNote (or similar) button. If you're using Internet Explorer, clicking on Open will bring the references into EndNote if it is installed in the PC you are working on. 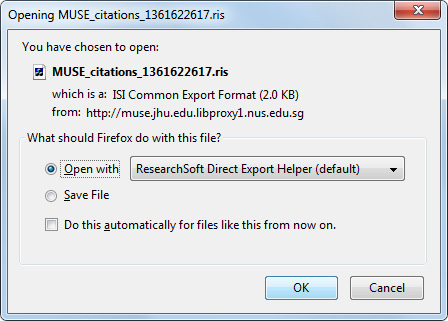 Change Open with to ResearchSoft Direct Export Helper (default) or EndNote X (version number), and click on Ok. If you're using Chrome, the .ris file will be downloaded, as can be seen from the bottom left of the browser window. Double click on the downloaded .ris file and the references will be automatically brought into EndNote. Save the .ris file into a thumbdrive or email it to yourself. When you get to a PC with EndNote installed, import the references into EndNote by going to File>Import File, and browse for the file. Change the Import Option to Reference Manager (RIS).